Miles from Nowhere by Amy Clipston. The Final Book in the Roadside Assistance Trilogy. Review: God puts special people in our lives for a reason. 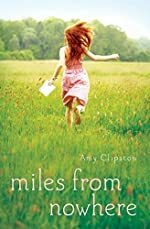 In Amy Clipston's Miles from Nowhere you will read about how one girl, Chelsea Morris, finds herself as she follows her heart. This book will lift up your heart about faith towards you beliefs and trust in other people. Chelsea Morris plans on having the perfect summer. She has a part time job at the Fork & Knife where her boyfriend works, and she is the head designer for the community production of Grease. Everything seems to be going swell for Chelsea. But then table's turn at the Fork & Knife, the main cook Maggie, just recently had a baby and now is on maternity leave. Todd parents own the Fork & Knife and he is also Chelsea's boyfriend. This was a totally bummer for Chels is pretty upset about this because this is the last summer before they headed off to state university; and she wanted to spend some quality time with her boyfriend. Being the unselfless girl she is supported him with his full time job but this meant he couldn't be part of the production of Grease. Which also leads back to spending less time with each other. As she spends her time at the playhouse she met a boy named Dylan a sophomore at the university. Everyday they have met each other's eyes but never spoke to each other. Eventually though Dylan asks her and her assistant designer to come to a cast party. This one cast party starts a chain of events that changed Chelsea. Now she is now breaking the rules at the theater, her new personality is interfering with her job and her relationship; she has now transformed into the party animal; drinking, ditching her brothers, hanging out with friends instead of doing her priorities. No one seems to know who Chelsea is anymore. Will Chelsea ever find her way back to her true self? Or has she become her true self? Find out the rest in Miles from Nowhere. This is a spectacular novel. I am an Amy Clipston fan; I have read most of her book and they all relate to the same thesis, to having faith in your beliefs. This book really pulled me compared to her other novels this one has a plot teens can relate to finding who you are within a difficult situation. The plot is well organized, not messy or rushed. I enjoyed the main character, Chelsea's, her personality. She is able to relate in a way that teens can see themselves in. For example, her friends support when she needs it the most; they helped her with finding herself. I recommend Miles from Nowhere for 12-15 year old girls because girls can gather a stronger moral from a girl's point of view. We would like to thank ZonderKidz for providing a copy of Miles from Nowhere for this review. Have you read Miles from Nowhere? How would you rate it?